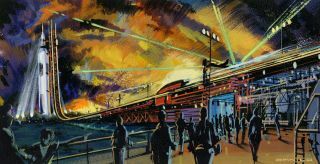 An artist's depiction of the Zero Gravity Rollercoaster "Vomit Comet" as envisioned by the design company BRC Imagination Arts. BRC Imagination Arts is proposing a "zero gravity" roller coaster that would give thrill seekers a stomach-churning ride including at least eight seconds of microgravity. The proposed ride takes cues from NASA's KC-135A aircraft, which was used to train astronauts and test equipment for spaceflight. The aircraft, nicknamed "the Vomit Comet," flew specific flight paths to mimic various states of microgravity. The KC-135A could fly a series of large parabolic arcs, allowing passengers to experience about 25 seconds of microgravity at the top. Elsewhere along the flight, the aircraft could give the sensation of approximately two times the force of gravity on Earth. Instead of following parabolas, the BRC ride – first reported by Popular Science– would accelerate people on a flat path parallel to the ground, then shoot them straight upward. As their enclosed vehicle approached the top of a tall tower, passengers would experience a floating sensation for about eight seconds. While conventional roller coasters involve open-air seating, the capsule used in BRC's Vomit Comet will be completely enclosed. This will enhance the thrill, Rogers said, since riders will not be able to gauge their own movement against fixed objects or the horizon. "The sensation is a bit like being in an enclosed room while someone fiddles with the gravity switch, turning it back and forth, between one-g, zero-g and double gravity," he said. The system would operate similarly to other high-acceleration roller coasters, but more-sophisticated controls would ensure the proper amount of acceleration and deceleration to achieve the sensation of microgravity, BRC officials said. Rogers did not disclose the exact speed of the Vomit Comet, but the company has said the enclosed capsule will accelerate to faster than 100 mph, then turn and race straight up along the track. When it reaches the correct speed, the capsule will slow very slightly, and passengers will feel themselves levitating away from their seats. It will be as if the riders had been tossed in the air and the capsule was simply flying with them, BRC officials said. As the speeds slow, the vehicle will then take the passengers down the track – only it won't seem as if they are falling, since they won't be able to see outside the capsule. BRC is aiming to give riders eight seconds of microgravity and possibly more, depending on the weight of the vehicle, the cost, and the engineering specifications. And while some may say that sounds too brief, Rogers insists the experience will be well worth it. "I was privileged to ride the real KC-135A and microgravity is one of the most astonishing, amazing sensations you will ever feel," Rogers said. "Eight seconds of it will feel like forever." BRC estimates that it will cost $40 million to $60 million to develop the Vomit Comet, and the high price tag is largely because of how precise the ride has to be. In fact, since the weight of the passengers will vary with each ride, the capsule must be weighed and the "flight" recalculated prior to each launch. During the ride, these calculations will be adjusted in real time to give riders the longest possible experience of microgravity, BRC officials said. But it won't be all fun and games. While the Vomit Comet would be primarily for entertainment, Rogers can foresee scientific and research applications. Experiment time on NASA's KC-135A, or other planned suborbital vehicles, is expensive and can sometimes involve a lengthy testing and approval process, he noted. "Provided your experiment is neither toxic nor explosive, you should be able to take your experiment aboard almost any evening on a couple hours' notice," Rogers said. "As a result, what started as a theme park ride could very quickly evolve into a very real and useful NASA research facility. Imagine this: Real microgravity is now available for grade-school science projects!" Passengers also might be allowed to try fun, safe "zero gravity" experiments during the ride, such as seeing how microgravity affects a small rubber ball, piece of string, or even a cup of water. "Liquids are amazing in zero gravity," Rogers said. "When gravity is removed, surface tension becomes the most powerful influence and the water spontaneously forms balls which undulate and float like suspended water balloons – or at least they float until you go back into 2G, and then they just might splash in your face. No ordinary roller coaster can do that." BRC stresses that safety will be paramount in the design of the Vomit Comet. Passengers will enter the capsule much as they enter an airplane, and the design of the seats is expected to be similar to an airliner's. So is "Vomit Comet" just a playful nickname, or will the ride be as stomach-flipping as it sounds? Either way, Rogers and BRC are going to be prepared. "All the angle changes would only be variations of one axis: pitch," Rogers said. "These are sensations that normally cause air sickness or sea sickness. Perhaps someone might become nauseous due to nervousness or excitement, but for that, each seat is equipped with what the astronauts call an 'emesis management system.'" Said another way, each seat will conveniently have a white paper bag. Just in case, right?